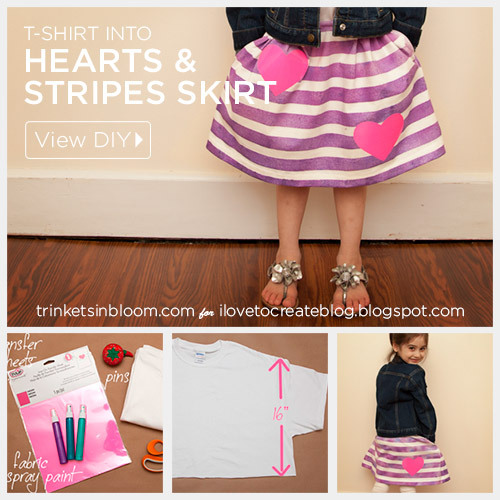 Almost anywhere you live it’s hard not to have spring fever right now and this DIY tutorial will show you how to turn a T-Shirt into a Skirt with Hearts and Stripes for girls, creating cute spring stripes and patterns using Tulip Fabric Spray Paints and Tulip Neon Heat Transfers. To put an extra spring in your step, I’ll also show you how to easily turn the sleeves into pockets! 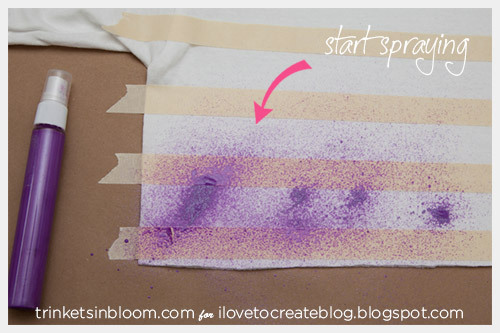 Layout your t-shirt on a covered flat surface. 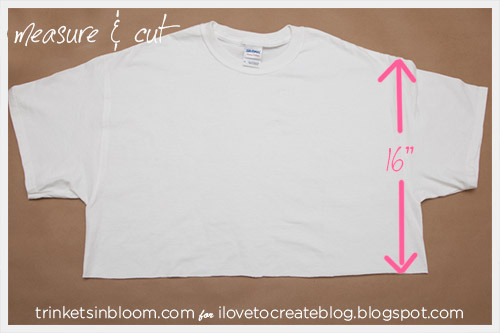 Measure your t-shirt to the length you want your skirt, add 1.5 inches and cut across your t-shirt. 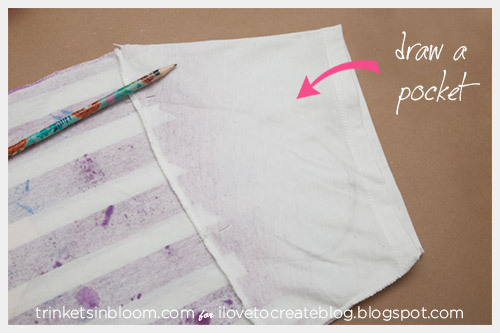 Place a thick sheet of paper or cardboard inside your shirt. 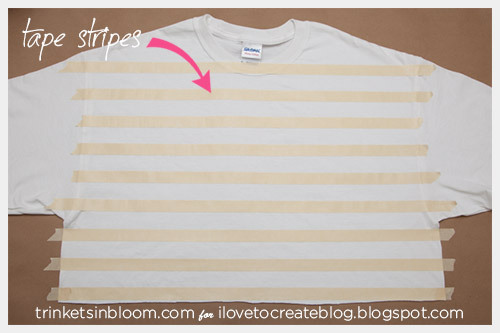 Put your tape across your shirt to make stripes. 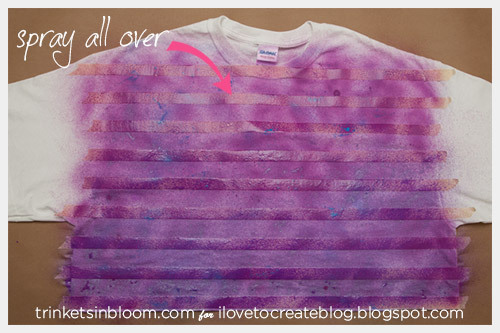 Using your Tulip fabric spray paints, spray your shirt to create stripes. Turn over and do the other side. 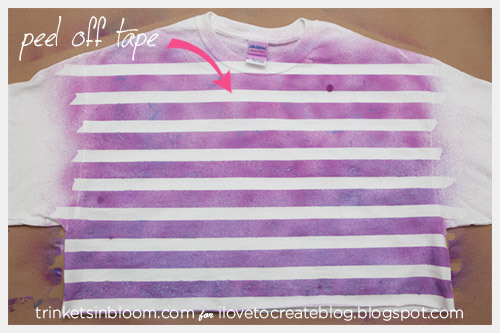 Peel off your tape to reveal your stripes! 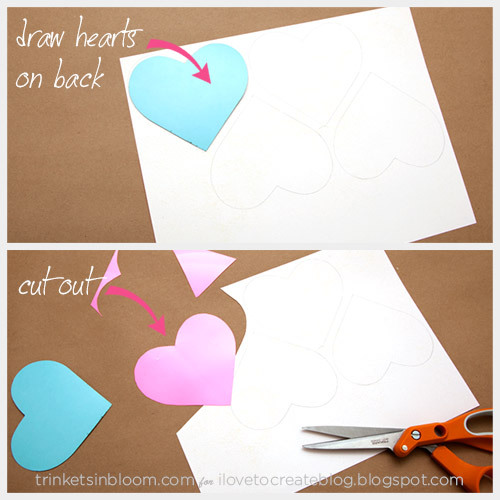 Using your paper and pencil draw a heart and cut it out. 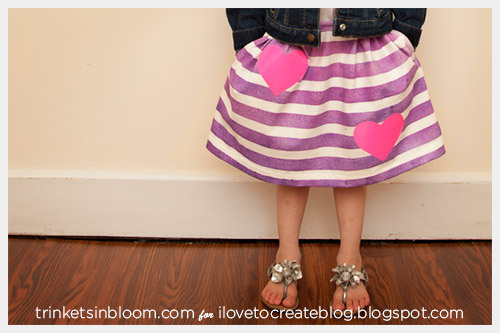 If you prefer you can use a heart stencil instead. Trace your heart onto your Tulip heat transfer sheet and cut it out. I made 3 hearts. Heat up your iron, I used the cotton setting with NO STEAM. 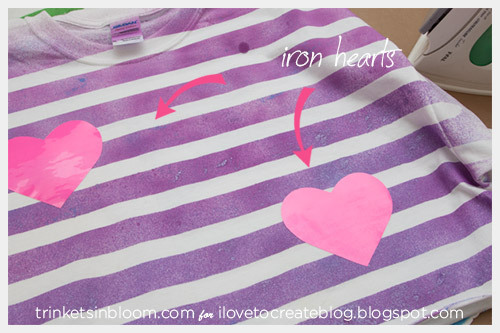 Place your hearts onto your t-shirt where you want them. Lay a cloth over your hearts and press carefully with your iron. Move your iron back and forth slowly doing one heart at a time. Don’t let your iron just sit on your t-shirt keep it moving slowly until your hearts have transferred to your t-shirt. 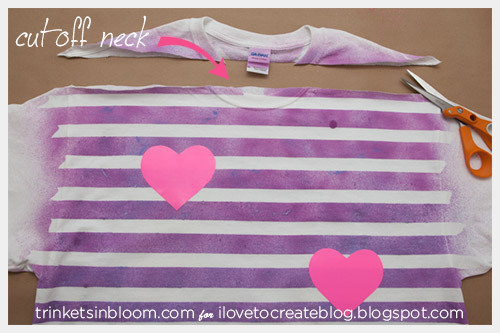 Cut the top neckline off your t-shirt. Cut straight across from the shoulders. 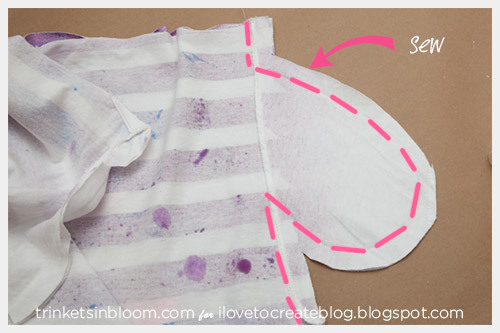 Turn your t-shirt inside out and lay flat. Mark on your sleeves where you want to sew them. Using your sewing machine sew a seam around your pockets and up an inch or so above the arm hole. Fold the neckline (where you just cut) over about 1.5 inches and pin. Using your sewing machine sew all around this hem leaving about 2 inches open to add your elastic. 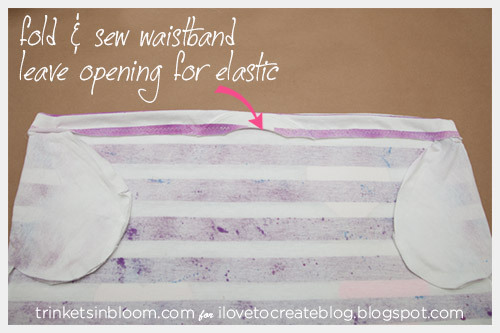 Measure the elastic to fit your waist plus 2 inches for sewing. 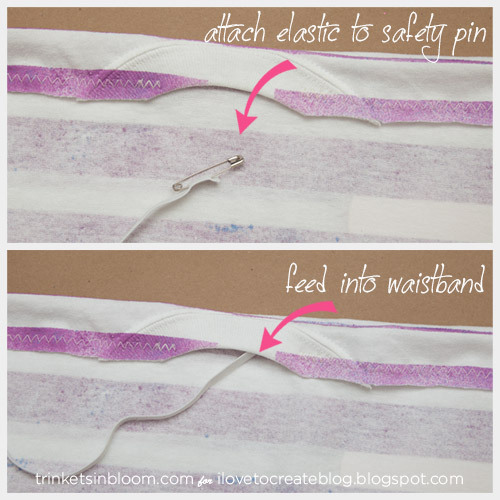 Attach the safety pin to one end of your elastic and run it through your hem. Sew your two ends together. 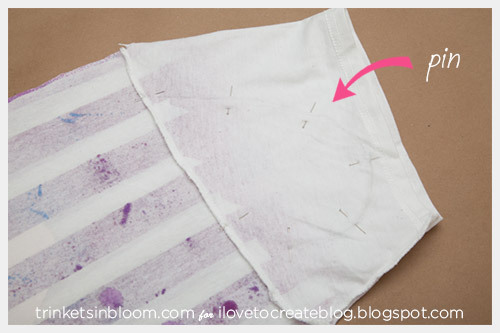 Fold your bottom hem and pin all the way around. Using your sewing machine sew your hem. Press your hem if necessary and voila! Enjoy! 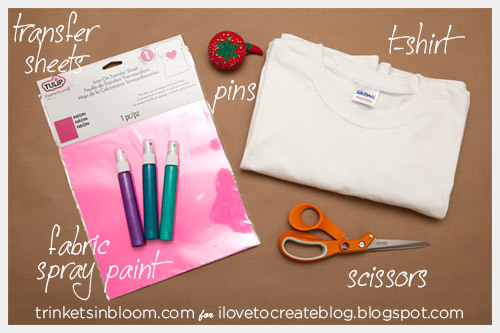 To see more fashion DIY tutorials please check out my blog Trinkets in Bloom. This is a really great tutorial. The design is really cute, I love the stripes!